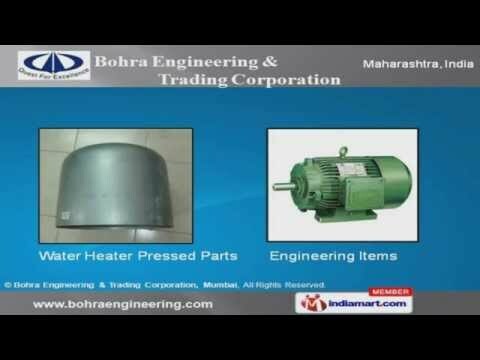 Welcome to Bohra Engineering and Trading Corporation. Manufacturer, Exporter and Supplier of Processing Equipment. We are an ISO 9000 certified company, established in 2003. Our Rigorous assessments for vendor selection make us the first choice of our clients. Competitive pricing, Transparent dealings and Quality products are some of the key factors behind our success. We offer a wide variety of Water Heater Electrical and Machined parts. We have gained tremendous expertise in providing Water Heater Pressed Parts and Engineering Items. Our company specializes in offering Turnkey Projects, Machined & Fabricated Parts. Our Water Heater Heating Element Flange Type and Water Heater Magnessium Casting Anodes are a class apart. We have expertise in offering Auto Engine Parts and Water Heater Tank. Electric Water Heater offered by us are some of our best selling products.